Previously I overviewed most of the biblical covenants and examined each one to see if they are still in force today and if they are, how they relate to the church age believer. I have already surveyed all of the biblical covenants except the final one—the New Covenant, which I will seek to do at this time. We have seen how the New Covenant will be fulfilled for Israel, but an often asked question is does this covenant relate in any way to the church? A New Covenant is mentioned a number of times in reference to the church in the New Testament (Matt. 26:27-28; Luke 22:20; 2 Cor. 3:6). It appears to be the basis for the forgiveness of sins and a spiritual dynamic that is not just reserved for the nation of Israel. I believe that there is one New Covenant, which will be fulfilled in the future with Israel but is participated in relation to the doctrine of salvation by the church today. 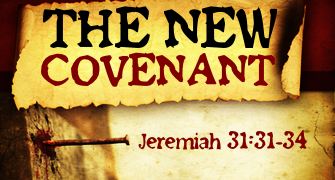 The Bible clearly teaches that God promised a New Covenant to His people Israel (Jer 31:31-34; Ezek 36:26-38) and that Jesus established the New Covenant through His death on the cross (1 Cor 11:25-26). "This cup is the new covenant in My blood; do this, as often as you drink it, in remembrance of Me" (1 Cor. 11:25). The inclusion of the Gentiles is substantiated by Jesus' statement in Matthew 26 enlarging the scope of the New Covenant when He says, "This is My blood of the covenant, which is poured out for many for forgiveness of sins" (Matt. 26:28). Luke records a similar statement when Jesus says, "This cup which is poured out for you is the new covenant in My blood" (Luke 22:20). Paul contrasted two covenants in 2 Corinthians 3:6-18. The first was the old Mosaic Covenant, while the second is the New Covenant. Under the old there are the tablets of stone, the letter, a ministry of death, and fading glory. Under the new there are tablets of flesh (human hearts), the Spirit, a ministry of life, and surpassing glory. The first has passed away. The second is now reigning. Paul is a minister of this New Covenant, as the passage says, "who also made us adequate as servants of a new covenant" (2 Cor. 3:6). So it appears that in some way the New Covenant applies to the current church age, even though none of the specific prophecies relating to Israel appear to have been fulfilled under the New Testament application of the New Covenant to the church age. We see in Scripture that the Church has not replaced literal Israel in its relationship to the New Covenant, and the New Covenant is not being fulfilled totally in the Church today. The New Covenant, prophesied in the Old Testament to be made with Israel, was ratified at the Cross and implemented as a replacement of the Mosaic Covenant. It is presently the basis on which anyone relates to God and it governs the life of all believers. The church, though not a formal partner of the New Covenant, participates in the covenant both as a subject of its rule of life and as a recipient of promised Abrahamic Covenant blessings for Gentiles that have come through the Seed of Abraham, Jesus Christ. "I will put My law within them, and on their heart I will write it; and I will be their God, and they shall be My people. And they shall not teach again, each man his neighbor and each man his brother, saying, 'Know the Lord,' for they shall all know Me, from the least of them to the greatest of them," declares the Lord, "for I will forgive their iniquity, and their sin I will remember no more" (Jer. 31:33b-34). "'But this is the covenant which I will make with the house of Israel after those days,' declares the Lord" (Jer. 31:33a). This is certainly not yet a description of the Jewish nation as it exists today. The Bible is clear that Israel will one day receive the benefits of the New Covenant. What a wonderful day that will be when she enters into a right relationship with the Lord after all of those years. At the same time, the church is a partaker in the spiritual blessings that flow from the New Covenant, not "a taker over" of Israel's promises, as some are inclined to say. God's plan is on course and will be fully implemented in the course of His timing. Maranatha! Arnold Fruchtenbaum, The Footsteps of the Messiah: A Study of the Sequence of Prophetic Events , (Tustin, CA: Ariel Ministries, 2003, ), pp. 410-11. Rodney J. Decker, "The Church's Relationship to the New Covenant," Bibliotheca Sacra (Vol. 162, Num. 608; Oct, 1995), pp. 455-56.